William of Malmesbury (‘GR’ III §261): “[Cnut] prepared, as we have heard, more than a thousand vessels against England; his father-in-law, Robert the Frisian [i.e. Robert, count of Flanders], the possessor of six hundred more, supporting him”. Internal dissent had obliged Cnut to postpone his invasion of England. As things turned out, it never happened at all. Cnut was killed by rebels on 10th July 1086. * He was canonized (St Knud) in 1101. The product of this great survey became known as the Domesday Book. Florence of Worcester (s.a. 1086): “[King William] commanded that his archbishops, bishops, abbots, earls, barons, sheriffs, with their knights, should meet him at Salisbury”. “After the birth-tide of our Lord Jesus Christ one thousand and seven and eighty winters, in the one and twentieth year after William ruled and governed England, as God had granted him, there was a very heavy and very pestilent year in this land. Such a malady came on men that almost every other man was in the worst evil – that is with fever – and that so severely that many men died of the evil. Afterwards there came, through the great tempests which came as we have before told, a very great famine over all England, so that many hundred men died a wretched death through that famine. Alas! how miserable and how rueful a time was then! When the wretched men lay driven almost to death, and afterwards came the sharp famine and utterly destroyed them. Who cannot feel pity for such a time? Or who is so hard-hearted that cannot bewail such misfortune? But such things befall for a folk’s sins, because they will not love God and righteousness. So it was in those days, that little righteousness was in this land with any man, save with the monks alone – wherever they behaved well. The king and the head men loved much, and over-much, covetousness in gold and in silver, and cared not how sinfully it might be got, provided it came to them. The king granted his land on very hard terms – the hardest he could. Then came some other and offered more than the other had before given, and the king let it go to the man who had offered him more. Then came a third and offered yet more, and the king gave it into the hands of the man who had offered most of all. And he cared not how very sinfully the reeves got it from poor men, nor how many unlawful things they did; but the more that was said about right law, the more unlawful things were done. They levied unjust tolls, and many other unjust things they did which are difficult to reckon. Also in the same year, before autumn, the holy minster of St Paul, the episcopal see of London, was burnt, and many other minsters, and the greatest and fairest part of the whole city. So also, at the same time, almost every chief-town in all England was burnt. Alas! a rueful and deplorable time was it in that year, which brought forth so many misfortunes! Orderic Vitalis (‘HE’ VII: iii, 245) says that, before they were released, King William, not unreasonably, insisted the prisoners: “take an oath to my ministers, for the security of the state, that they will use every means to preserve the peace both in Normandy and in England, and will steadfastly resist the enemies of tranquility to the utmost of their power.” According to Orderic, the king had initially excluded Odo from his amnesty, but eventually gave way (against his own better judgement) to the entreaties of the bishop’s friends. .... If anyone desires to know what kind of man he was, or what dignity he had, or of how many lands he was lord, then will we write of him just as we, who have looked on him and once-on-a-time lived in his court, perceived him. According to the tradition preserved in the, so-called, ‘Chronicle of Battle Abbey’, before the battle of Hastings, Duke (“so shortly to be a king”) William, vowed that, should God grant him victory, he would build a monastery on the battlefield. His oath was heard by one William the Smith, a monk of Marmoutier. William of Malmesbury (‘GR’ III §279): “He was of moderate stature, extraordinary corpulence, and fierce countenance; his forehead was bare of hair; he was of such great strength of arm that it was often matter of surprise that no one was able to draw his bow, which he himself could bend when his horse was at full gallop; he was majestic, whether sitting or standing, although the protuberance of his belly deformed the dignity of his appearance; of excellent health, so that he was never confined with any dangerous disorder, except at the last”. .... He was also very dignified. Thrice every year he wore his crown, as oft as he was in England. At Easter he wore it in Winchester; at Pentecost in Westminster; at Midwinter in Gloucester. And then were with him all the great men over all England – archbishops and suffragan bishops, abbots and earls, thegns and knights. So also was he a very rigid and cruel man, so that no one dared do anything against his will. He had earls in his bonds who had acted against his will; bishops he cast from their bishoprics, and abbots from their abbacies, and thegns into prison; and at last he spared not his own brother, named Odo. He was a very powerful bishop in Normandy – at Bayeux was his episcopal see – and he was the foremost man besides the king; and he had an earldom in England, and when the king was in Normandy, then was he master in this land; and him he put in prison. Among other things is not to be forgotten the good peace that he made in this land; so that a man who was of any account might go over his realm, with his bosom full of gold, unhurt. Nor dare any man slay another man, had he done ever so great evil to the other. And if any common man lay with a woman against her will, he forthwith lost the members with which he played. He reigned over England, and by his sagacity so thoroughly surveyed it that there was not a hide of land within England that he knew not who had it or what it was worth, and afterwards set it down in his writ. Wales was in his power, and he therein wrought castles, and completely controlled that race of men. In like manner he also subjected Scotland to him by his great strength. The land of Normandy was naturally his, and over the earldom which is called Maine he reigned; and if he might have lived two years more, he would, by his astuteness, have won Ireland, and without any weapons. Certainly in his time men had great hardship and very many injuries. and poor men to be greatly oppressed. from his people, with little need. He forbade the harts and also the boars to be killed. land or property or his good favour. raise himself up and account himself above all men! and grant him forgiveness of his sins! The ‘Anglo-Saxon Chronicle’ places Cnut’s death in the following year, 1087, and this placement is perpetuated by Florence of Worcester, William of Malmesbury, et al. This annal is wrongly dated 1085 – the scribe inadvertently repeating that year-number, instead of moving on to 1086. This error puts the ‘Chronicle’ one year behind the true date until, by dropping the year-number 1088, order is restored in 1089. Apulia, in southern Italy, was ruled by a Norman duke. Although the ‘Chronicle’ clearly gives the correct date in the text, the annal is incorrectly numbered 1086. King William had arrested Odo, his half-brother, in 1082 (see: Trials and Tribulations). Earl Morcar and Siward Barn had been captured at Ely in 1071 (see: Outlaws). Earl Roger had been imprisoned following an abortive rebellion in 1075 (see: Revolt of the Earls). Though both Florence of Worcester and Orderic Vitalis (‘HE’ VII: iii, 245) mention Roger’s inclusion in King William’s deathbed amnesty, Orderic had earlier (‘HE’ IV: ii, 264) made it very clear that Roger was, in fact, never released – he died in prison some unspecified time after 1087. Wulfnoth, King Harold’s brother, had probably been in captivity since 1052 (see: The Mighty Fallen ...). Brytland – in this case, almost certainly Wales rather than Brittany. King Swein Estrithsson (Swein II) of Denmark was succeeded, sequentially, by five sons. The first, Harald Hén, (Harald III), had died in 1080, and been succeeded by Cnut (Cnut IV). 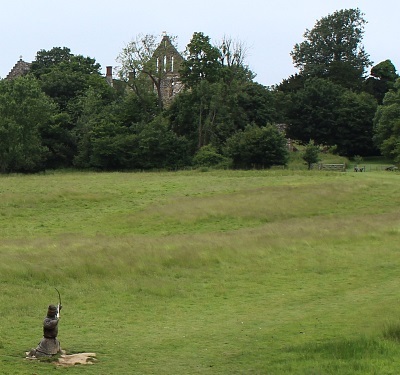 Pictured: The wooden sculpture of a Norman archer takes aim at the remains of Battle Abbey. Christ Church, at Canterbury, had been devastated by fire in December 1067. In August 1070, Lanfranc, abbot of Caen, was appointed archbishop of Canterbury. Though King William was survived by three sons, he had had four, of whom Richard was the second. Richard features in the witness-list of a charter of 1069 (Davis ‘Regesta Regum Anglo-Normannorum’ No 26), but in 1074 (‘Regesta’ Nos 73+75) his younger brother, William Rufus, occupies his place. Manuscript E is by this time the only version of the ‘Chronicle’. The name Orderic gives to the site of the battle of Hastings, Senlac, is unique to him. The ‘Chronicle of Battle Abbey’ is actually two chronicles bound together in British Library MS Cotton Domitian A ii. Both chronicles are anonymous, and both date from the late-12th century. Eadmer (an Englishman, born shortly before the Norman Conquest) was a monk at Christ Church Canterbury (indeed, he had been there since boyhood). He became a close aide to Anselm (St Anselm), archbishop of Canterbury 1093–1109. The ‘Historia Novorum in Anglia’ (History of Recent Events in England) is primarily concerned with Anselm’s career, though, as Eadmer notes in the preface: “My story will also include a number of other occurrences which took place in England ... occurrences of which we do not think it right that those who come after us should be deprived of all knowledge, so far as it is within our power to prevent it.” The ‘Historia’, as first produced, concluded with the aftermath of Anselm’s death in 1109, and was completed by 1114. Eadmer later added extra material, concluding in 1122. Page number in Martin Rule’s edition of the ‘Historia Novorum in Anglia’ (1884).